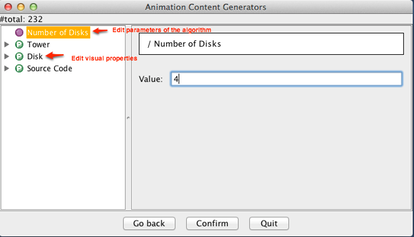 Please be aware that ANIMAL contains a lot of animation generators (currently, there are more than 500!). Thus, these short pages serve only to point out some aspects, and certainly do not reflect “everything that ANIMAL offers”. It would be more accurate to say that they barely scratch the surface! A perceptive user has asked why the file date of most of the animations in the "current animations ZIP archive" is so far outdated. Most animations are several years old, so how can I claim that "something new is happening with ANIMAL"? The animations in the ZIP archives have been hand-crafted, a painstaking and comparatively slow process of (usually) a couple of hours. As such, there is no "code" available that can produce or reproduce the exact animations. The ZIP is a convenience service that outlines some of the things that ANIMAL can do. However, some of the more current things are missing, and this especially concerns the Generator Framework that allows you to create animations on-the-fly, with just a few mouse clicks and entering the data to work upon. (Assuming that an appropriate generator exists, that is). Since the introduction of the Generator Framework, it would be easy to generate an (almost) arbitrary number of example animation, by the simple expedient of entering different parameter values to the generator. However, to me, this would feel a bit like "cheating", as it means I can drive up the "number of available animations" to any arbitrary value, given enough mouse clicks (and time). Thinking about it, I could have generated one example animation for each generator and included this in the (old) ZIP archives. 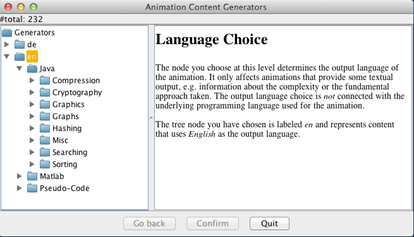 However, this simply never occurred to me, since the current approach of generating animations is so easy. Thus, the new content is not "included". 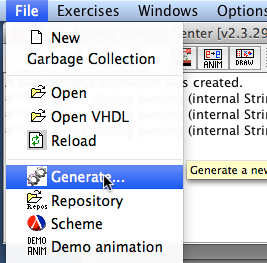 Select the File menu and choose the Generate… option. After a few seconds, a new window opens that seems to include only one node. 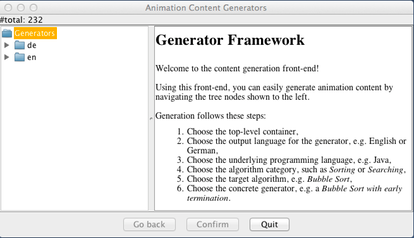 Double-click the Generators tree node to open the first level of the generator tree, containing the natural languages used for explanations (given by their ISO code, i.e., en for English, de for German etc.). Double-click the language you prefer. Similar to step 3, double-click nodes to select the underlying programming language (e.g., Java), algorithm type (e.g., Sorting) and concrete algorithm (e.g., Insertion Sort). You now see a list of available generators. Choose one by clicking on it, reading the description in the window to the right, and then click Confirm below. Configure the run-time parameters of the algorithm. These will be either primitive values - the data the algorithm works on - or graphical properties - adjusting how elements are shown, for example by changing colours. Click Confirm again when you are done. Select a file to save the animation to and click Confirm. 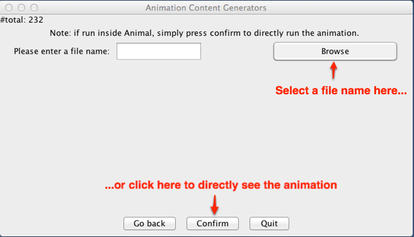 Alternatively, ignore the file dialog and click Confirm directly to ask ANIMAL to open the animation at once. When you closely look at the Generator window, you will see that more than 300 different algorithm generators are shipped with ANIMAL. 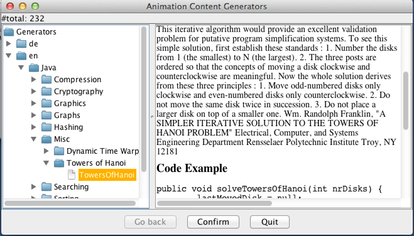 Imagine how large the example animation ZIP file would be if I included at least one animation from each generator…! Version 2.3.30 of ANIMAL introduces a new, easy to use yet expressive feature: automatic visualization of read- and write-accesses to data structures at the animation author's request! The interesting information here are the two bars indicating the number of assignments and (read) accesses on the array, so far - 6 and 42, respectively. 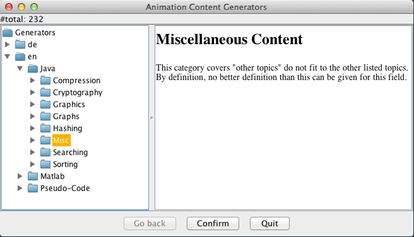 You might ask yourself what the animation author has to do to get this functionality… Well - the answer is: not much! counter = lang.newCounter(array); // array holds a reference to the actual array. First, we create a new counter on the array used to hold the values. This creates a new counter that will now monitor read and write accesses to the array. Then, we create and specify the visual properties of the counter. It shall be filled (line 3) and the actual fill color shall be 4 (line 4). Finally, we create a view for the counter. This receives the counter itself (created in line 1), the x and y coordinate, the counter properties created in line 2, and two final boolean parameters indicating whether we want to see the numeric value and/or the bars. Here, we want to see both, and thus pass in true twice. And… that's it! All future accesses to the array will now be counted and visualized, until you use view.hide(); to hide the complete visualization from the end user. The Shannon-Fano compression algorithm first examines all elements of the text (or binary data) to be compressed and counts their frequency in the source. It then sorts the actual symbols contained in the source by descending frequency, so that the most common element will be at the left and the least common one at the right. It then segments the list into two sections such that the sum of the number of occurrences of elements to the left is as close to the sum of occurrences of the elements to the right as possible. A 0 is then assigned to the left section, and a 1 to the right section, and the algorithm recursively continues splitting and assigning a value until no further split is possible. In this way, each input element will be assigned a sequence of 0/1 values - and thus a binary encoding. The source data is then compressed by replacing each element of the source with its binary encoding, which will typically have a far shorter length (at least, for the more common elements) than the usual 8 bit encoding. 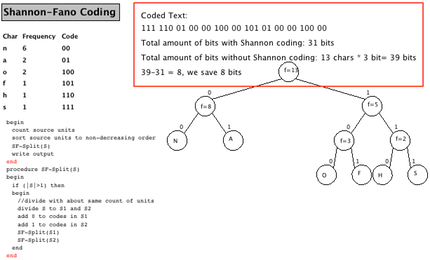 In the generator, the user can specify a string to be encoded; the default string to be encoded is "shannonfannon", where it is obvious that "n" is the most common character (6 occurrences), followed by "a" and "o" with two occurrences each, and the other characters ("s", "h", "f") with one occurrence each. The algorithm starts with a verbal description of the algorithm, as shown below. In the next step, the process of segmenting the elements into two halves and assigning a bit value, and the further segmenting elements. At the time of the screenshot, "N", "A", "O" and "F" have already been assigned a final code, and the process has to continue for "H" and "S". 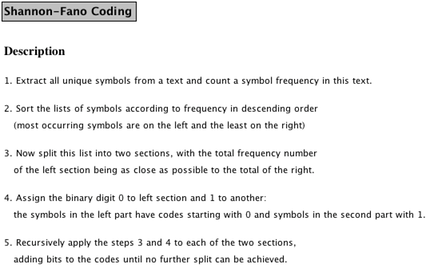 The animation ends with the final encoding for each input character, as shown in the table to the left in column "Code", and also visible in the tree. It also provides the Shannon-Fano encoding of the source and gives a rough approximation of the space saved (highlighted here with a red box which is not part of the actual animation). In this example posting, we examining one concrete output of the generation process. Because this is the first such step, we will provide a few more details than we will do in later postings. 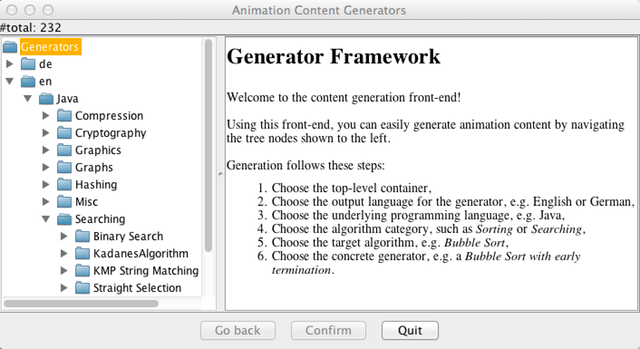 First, start the generation process as outlined in the blog posting How to create a new animation using a generator by selecting File ➜ Generate…. 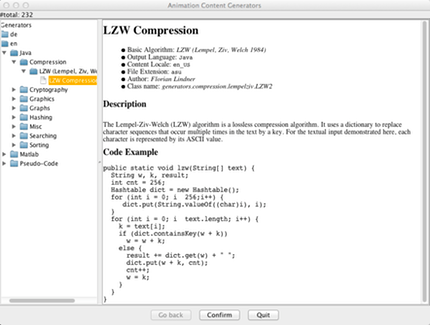 Then navigate to English (en), Java, Compression, and choose the algorithm LZW (Lempel, Ziv, Welch). You will see a window as blow that gives some basic details on the generator, includings its author and the name of the class (in case something was broken, you can use this to report a precise error). You can also see the underlying implementation code in Java at the bottom. Next, click on Confirm to see the options. 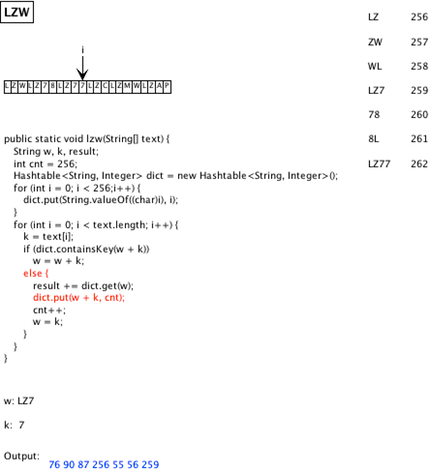 The algorithm has one parameter, as also indicated on the screenshot above, called stringArray in this case. You can adjust the value by modifying the length of the array ("Number of elements" - please make sure to press RETURN when you change the size to notify the Java program of the change!). Here, we leave the array in its default state, which was chosen to give some helpful output. We could also modify the display options of six different entries, but we will leave them alone here. Click Confirm to confirm the values, and then either choose a filename to save the file (and load it in later), or click Confirm again to directly see the animation. The animation starts with a very brief overview of the algorithm and how it works "in plain English". There is no screenshot for this here; put simply, the algorithm maintains a dictionary of entries, where each "word" is associated with a number. The dictionary initially contains the entries 0-255 for the 256 entries in the ASCII character set. Whenever a new word combination is encountered, for example "LZ", the algorithm checks if this "word" is already in its dictionary. If this is the case, we add the next input character and repeat the process. If not, the new "word" is added to the dictionary at the next free position and the encoding for the "last known word" (shorter by the last character) is added to the encoded output. In the next image, you see the main animation. The red code line is the one currently being executed, in the context of the "else" statement. We have just added the text LZ77 to our dictionary with the numerical value 262. The last output was 259, representing the LZ7 part of the "word" that was already contained in the dictionary. The next word to be encoded would be 7L, using the last 7 of the previously unknown word LZ77 and the next character (right next to the arrow) L; this will again be added to the dictionary as a new element and the code for 7 (55) will be added to the output. One of the great advantages of the LZW compression algorithm is that the dictionary can be rebuilt from the compressed contents and thus does not have to be transferred, saving network bandwidth and/or disk space. Why don't you try out the generator on your own? The following algorithm topic categories are currently supported and filled with at least some content in the ANIMAL AV system. Please note that some of the categories may only provide examples for a certain combination of natural and programming language! Backtracking algorithms try out one possible solution for a problem until they have either solved the problem or found a "dead end". In the latter case, they go backwards one step ("backtrack") and take the next possible route - again, until the problem has been solved or a "dead end" has been encountered. A "dead end" is typically an illegal state, the meaning of which depends on the underlying problem. For example, in the "8 Queens Problem", eight queens have be placed on a chessboard so that no queen may strike another queen. Here, an illegal state occurs whenever one queen can strike another one (note: this will always be due to the last queen placed). In other applications, a state may be "illegal" if its result is already worse than the best result found so far. Compression algorithms describe how content can be stored using less space than if it were stored directly - and of course how the original content can be restored from the "space-shrunk version". Typical and popular examples include space-saving storage of images (for example, using the JPG or PNG format instead of the bitmap-based BMP format), audio (MP3 versus WAV), video (MP4 and other formats), as well as the compression of large archives (ZIP being probably the most well-known format) - which are also typically used when you download Windows, Linux, or Mac OS X installation files. Cryptography algorithms deal with making content "unreadable", or at least harder to read, for unintended parties - and how to restore the actual content by the intended recipient. As such, they are widely used in communication, for example in the https:// protocol that indicates an encrypted data transmission between your browser and the server, and should be used whenever privileged data such as passwords or bank account-related information is transferred. ANIMAL is - together with its cryptographic visualisations for Caesar, Vigenere, Nihilist and DES - part of the wide-spread, open-source e-learning program CrypTool v1 (http://www.cryptool.org). Data structures algorithms portray the characteristic behaviour of a given data structure, for example how data is inserted, found, or deleted. Graph algorithms include many algorithms in Computer Science that deal for example with finding the cheapest route from one node to another. They are used in many concrete problems, so that a good understanding of graph algorithms is very important for a good programmer. Graphics algorithms deal with approaches to render objects on the screen, or determine which objects shall be shown in which order and to what degree. For example, if a 5000x3000 pixels large image shall be shown on a far smaller area, it either has to be scaled "appropriately" to fit the area available to it, or it should be "cropped": those portions of the image not visualizable on the output area do not have to be drawn, saving computation effort. Hardware-based algorithms visualize the behaviour of the hardware components underlying modern computers, for example logic gates or multiplexers. Hashing algorithms allow the representation of arbitrary content linked to a "key". For example, the complete data of a student may be retrieving by providing the student's student ID as the "key". If used properly, hashing allows "instanteous" access, avoiding the effort to search for the data in a collection, such as a list or array. Mathematics also contains a set of algorithms, although mathematicians would typically not label them in that way. This includes various approaches to determine eigenvalues, invert matrices, or (cleverly) multiply matrices. Misc is the "catch-all" category for all algorithms that do not fall into any of the other categories. Networking algorithms portray Internet protocols and their data flow or show how the (typically graph-based) routing algorithms that determine how to send data from client A to client B work. Searching algorithms deal with finding a given element in a collection. Apart from well-known algorithms such as Binary Searching, this also includes other applications, such as finding a text inside a larger text - a typical application for any text editor (but harder to implement well than one might at first think!). 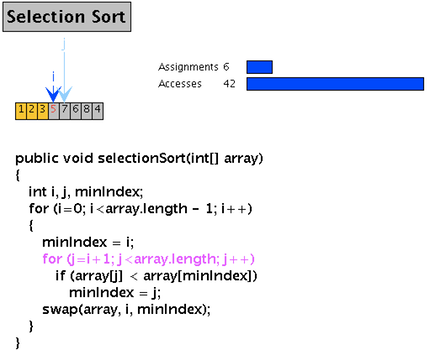 Sorting algorithms work on reordering a collection of elements into a well-defined order. The order can be rather straightforward (e.g., ascending numbers), but can also be more elaborate (e.g., phone books order persons by family name, followed by first name, street and then phone number if the previous entries were identical). 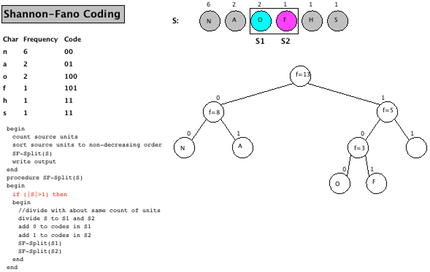 Tree algorithms work on another very important data structure used in many algorithms. They can be used for easy and efficient navigation among elements, and to represent hierarchical structures, among (many) other applications. As you can see, there is a lot to explore using ANIMAL! In this step-by-step guide, you will see how easy it is to create a new animation using one of the many content generators provided by ANIMAL. First, select the target language. This determines in what language the textual comments - not the program itself - will be shown, if any. Here we have selected en for English. Please also note how the program explains each step as you click on an entry in the unfolding tree. In the next step, you can choose the programming language of the underlying implementation. Typically, you will be able to choose at least between Java and Pseudo Code, a textual description of what the algorithm does. Since this step is not very surprising in its content, we do not offer an image for this step. Now choose the concrete algorithm category. The prepared categories include the most common applications for undergraduate CS students and programmers, such as compression, cryptography, graphics, graphs, hashing, searching, sorting, maths and miscellaneous. Again, the category will described in the panel to the right. Once you have opened the category, you will see a list of concrete algorithms available in the category. 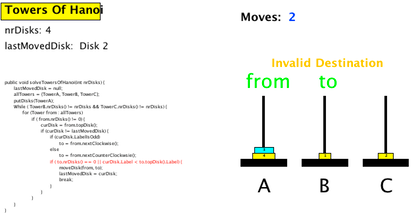 Here, we select the Towers of Hanoi algorithm. Note how the panel on the right will display author information, a description of the algorithm, and below an overview of the underlying code. This information shall help you in figuring out if this was exactly what you were looking for. After confirming that this is indeed what you were looking for, you will be taken to a view where you can modify both the parameters of the algorithm (indicated by a purple circle before their name) and/or visual properties of the animation. In this example, there is only one parameter ("Number of Disks", which we have changed from its default value 3 to 4), and three different visual properties you can adjust, defining how a tower, disk and the source code shall be displayed. When you are done, press Confirm. Now you can choose whether you want to save the animation (click on Browse… for this purpose and choose a directory and filename), or want to directly see the result (simply click on Confirm without choosing a filename first). Finally, here is the animation content. Note that you will also be asked if you want to close the generator window or not (not shown here). In this blog, we will describe some of the many animations that are available in the Animal algorithm animation system. 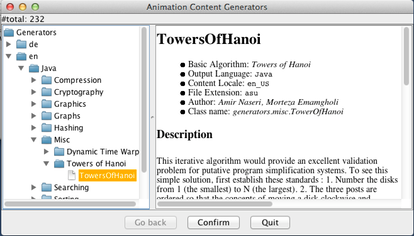 The animations are all created dynamically by opening the File menu and then selecting Generate…. After a short moment, another window will open that will show the available natural languages supported for the output. Currently, these are restricted to German (ISO code de) and English (ISO code en). Open the language item to see the programming languages, especially Java and Pseudo Code, and open this item to see the topic areas, for example, compression, cryptography, graphics, graphs and several others. In this category, you will see the concrete algorithms and inside them the actual generator implementations. The screenshot below illustrates the navigation; here, we have opened the searching algorithms category for a target output using Java syntax in English (en).